I'm sorry, I just couldn't wait any longer to take off the Incoco and try more of my holiday polishes. 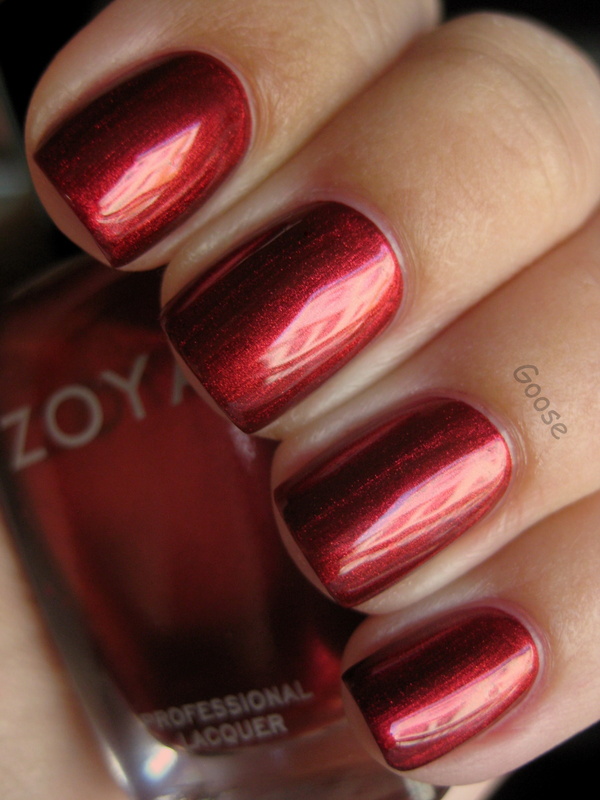 Today I was in the mood for a nice rich glowy red, and Zoya Isla fit the bill perfectly. This covered nice and easily in 2 coats. I'm head over heels for this color, and it's making me feel so Christmas-y! I absolutely cannot wait for Thanksgiving this Thursday, because that means it's officially the Christmas Season! While I'm not religious at all (I'm actually atheist/agnostic), the holidays are one of my favorite times of the year just because of the time spent with my family. I'm so very close to all of my family and our get-togethers are always lots of fun! I started the morning with eggnog and the Muppet Christmas Carol while I crocheted some gifts for my family. I can't wait to put up the Christmas tree and decorations on Friday!! wow, your nails look fantastic! and this polish is awesome! super pretty! This is a really pretty red! Am so jealous of your nails! It's very pretty and makes me think of China Glaze Thunderbird and A-england Perceval.